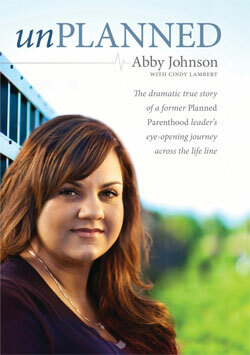 Earlier this year, I read Abby Johnson's, Unplanned, as part of my research for Abort73's "Crisis of Conscience" page. The book chronicles Abby's dramatic departure from Planned Parenthood after eight years in their employ–the last three as the director of one of their Texas abortion clinics. Combining her testimony with those of Bernard Nathanson, Norma McCorvey, and Carol Everett, Abort73's "Crisis of Conscience" offers an inside-look at the abortion industry and examines the factors that led these prominent abortion-practitioners to reverse their course. Along the way, I authored some accompanying blog posts to give more individual attention to each story–except I forgot to do one for Abby. I was reminded of that last week when I inserted a quote from her book into Abort73's "Birth Control and Abortion" page. I appreciate most of what I've read on this site, but your lambasting of Planned Parenthood isn't called for because it's very inaccurate. Yes, they perform abortions, but abortions only account for 3% of the services they provide. They also provide things like cancer screening and birth control (35% of their services). So obviously they DO care about things other than abortion. You're hurting your credibility to suggest otherwise. When it's not clear to you what abortion is and does, Planned Parenthood's revenue agenda might not seem that big a deal. What's so bad about abortion? It's legal. Nobody is forcing these women to abort. Why shouldn't Planned Parenthood make as much money as they can? But when you see abortion up close, it goes from being a necessary evil to being an indefensible evil. Had Abby learned that lesson sooner, she almost certainly wouldn't haven fallen prey to Planned Parenthood's recruiting spiel, nor would she be living with the grief of two abortions. Growing up, Abby and her family "had always attended church together," and she was "active in church youth group." (20) She considered yourself "pro-life," and yet "[she'd] never carefully thought through the issues and arguments… In fact, [she'd] made it a point to avoid discussions of abortion." (13) In the end, she became a "pro-choice Christian" and knew lots of other people in the same boat. (58) Let that be a warning to anyone who thinks church kids automatically know that abortion is wrong and a wake up call for any youth pastors who aren't helping their students think critically and accurately about abortion.